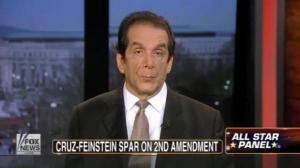 RUSH: Now, Ted Cruz and Dianne Feinstein and guns. I think what I want to do… Yeah, let’s start with number three. We’ve got three bites from yesterday morning in Washington. This is during a Senate Judiciary Committee hearing marking up gun control legislation. Up first is Ted Cruz speaking to Senator Dianne Feinstein of California. CRUZ: The question that I would pose to the senior senator from California is: Would she deem it consistent with the Bill of Rights for Congress to engage in the same endeavor that we are contemplating doing with the Second Amendment in the context of the First or Fourth Amendment? Namely, would she consider it constitutional for Congress to specify that the First Amendment shall apply only to the following books and shall not apply to the books that Congress has deemed outside the protection of the Bill of Rights? Likewise, would she think that the Fourth Amendment’s protection against searches and seizures could properly apply only to the following specified individuals and not to the individuals that Congress has deemed outside the protection of the Bill of Rights? RUSH: Are you applauding, folks? Are you standing up and cheering here? This is just not done! These people are never called on this. Here’s Dianne Feinstein with her list of approved guns. Dianne Feinstein, California senator, former mayor of San Francisco. Okay, fine. Great resume. You and you alone are gonna determine what kind of guns we can have all? So Cruz said, “Well, are you going to determine what books we can all read? Are you gonna determine what words can’t be said and what words can?” and liberals are not used to this. This is effrontery. This is lecturing. This is disrespect, as far as the left is concerned. Dianne Feinstein was not happy with this, and she told Cruz not to lecture her. FEINSTEIN: I’m not a sixth grader. Senator, I’ve been on this committee for 20 years. I was a mayor for nine years. I walked in and I saw people shot. I’ve looked at bodies that have been shot with these weapons. After 20 years, I’ve been up close and personal to the Constitution. It’s fine you want to lecture me on the Constitution. I appreciate it. Just know I’ve been here for a long time. I passed on (sic) a number of bills. I study the Constitution myself. I am reasonably well educated, and I thank you for the lecture. Incidentally, this does not prohibit — you used the word “prohibit.” It exempts 2,271 weapons. Isn’t that enough for the people in the United States? I’m comforted Dianne Feinstein has studied the Constitution. She said she’s even “reasonably well educated,” and she says she’s been up close and personal to the Constitution. It doesn’t matter if she doesn’t know what’s in it. If she doesn’t agree with what’s in it, if she doesn’t respect what’s in it, what does it matter how close she’s been. She could sleep with it every night for all I care. If she doesn’t like what’s in it, what difference does that make? But notice she didn’t dispute Cruz on the substance of anything. She turns this around. This is a personal attack, and how dare he? It wasn’t a personal attack at all. He was simply talking about the Constitution. CRUZ: I would note that she chose not to answer the question that I asked, which is: In her judgment, would it be consistent with the Constitution for Congress to specify which books are permitted and which books are not and to use the specific number? RUSH: Well, then why didn’t you say so at the get-go? Anyway, Dr. Krauthammer didn’t like what Cruz did here. Krauthammer on Fox did not appreciate what Cruz did. Well, let’s listen to Dr. Krauthammer. He was on Special Report with Bret Baier last night, and they were talking about this, and this is what Dr. Krauthammer, who’s on Fox, said. KRAUTHAMMER: There was an interesting exchange and in the end Cruz overshot. The manner in which he asked it, I think it appeared a little bit offensive. I don’t think Cruz helped himself. FEINSTEIN: Well, I just felt patronized. I felt he was somewhat arrogant about it. And, you know, when you’ve come from where I’ve come from and what you’ve seen and when you found a dead body and you put your finger in bullet holes, you really realize the impact of weapons. FEINSTEIN: No. I needed to cool down. BLITZER: Have you cooled down yet? BLITZER: So when you see him the next time what will you say? FEINSTEIN: Oh, yes. Oh, yes. Well, I did say, “Look, I’m sorry, but, you know, this is one thing that I feel very passionately about, and I appreciate the lecture, but –” and that’s all I’m gonna say. RUSH: You know, she can look at it as a lecture. The problem here is that one side is dealing with this as a constitutional issue and the other side, Dianne Feinstein, is not. She’s dealing with it purely as an emotional issue. You know what she’s dealing with, Snerdley? As a female news editor on a TV newscast deciding what to show and what not to show. The chickification of the news. In fact, in the stack I have a story about that. Some guy, I think his name is Nolte, I have to find this. It’s in the stack here and it’s not a very big stack today, I’ll get to it, about the chickification of television and how more and more women are determining what everybody watches on TV. This guy cites this rave show on HBO, starring Lena Dunham. Is that her name? The woman did the commercial for Obama saying, “Your first time is really important”? Yeah. First time. Don’t just do it with any guy. You know, pick from five or six. And she was talking about your first vote. Well, she’s got this show on HBO called Girls. That show. Now, if you knew nothing other — and let me do a test, Snerdley, you react. What do you know of that show? So you watched 20 minutes, fine. What is your impression of that show, as you listen to media buzz, Lena Dunham’s all over the place. She’s a guest on Letterman. She’s apparently the architect for what young women ought to be today. What is the impression that you have? The show is huge, right? Is that the impression you get in the media? Everybody’s watching, everybody. And that show’s cutting edge. Only 600,000 viewers. That is this guy’s point, not even a million. Fewer viewers than The Daily Show. This has been my point all along about media buzz, how they go out and create this notion that something’s hotter and more popular than anything in the world, when it isn’t. And his point is that you’ve gotta be very careful in assessing what really is popular and what really isn’t and how things that aren’t popular are kept on the air by virtue of buzz or bias or what have you. And his point was that it’s because women are making programming decisions on an emotional basis. I am just telling you what he said. RUSH: Here’s the thing, folks. You know, Dianne Feinstein got famous for being around when Harvey Milk was assassinated in San Francisco. That’s how she became mayor, and she was on the scene when he was killed, and that’s what she’s talking about when she says that she’s seen the gore and the bullet holes, and she’s plugged her finger in there and all that. The thing is, nothing in her bill would have prevented Harvey Milk’s murder. Which doesn’t matter. You see, all that matters is that she is trying to eliminate suffering and she’s exhibiting compassion. So she wants to exempt 2,200 weapons. The problem is the Constitution doesn’t exempt, the Second Amendment doesn’t exempt anything. And if I may be so bold, the Second Amendment is in the Constitution to help citizens protect themselves from people like Dianne Feinstein who would come along, and if they could determine what words you can and cannot say, where and where you can’t say them. The Constitution is there to protect you from mayors like Mike Doomberg who wants to tell you how big your beverage can be. He’s not a federal official, I understand. But the principle is the same. The Constitution was written to protect individual freedom and limit the ability of the government to encroach upon it. And it’s been turned upside down now. The liberals don’t like that. The Democrats are very unhappy. The Constitution limits government too much. So they want to rewrite it, have a second Bill of Rights. They call it a charter of negative liberties, which we all find strange. The Constitution, negative liberties? It defines our freedom. But not them in government. Government limits their freedoms. So that’s why it’s negative. So they want a new Bill of Rights that spells out what government can do instead of a Bill of Rights that tells government what it can’t do. And so everything is out of phase. Cruz understands this, and every Democrat shakes in fear when he opens his mouth about the subject.